I am not posting enough about ‘Interesting Science,’ so here is Ed Yong’s post on how sailfish hunt sardines. The sailfish sidles up to a small school and swishes the sword around to slash and stun the sorry sardines. Okay, enough with the alliteration. They don’t use their bill to spear or poke the fish, but wield it like a baseball bat to wound, or at least disorient. The video clearly shows the fish do not see the bill as it comes up on them. I wonder if they are distracted by the large body and sail, so do not notice the thin and dark gray bill until it is much too late. Very interesting. Just to rebel against tradition, this is clearly not my cat. 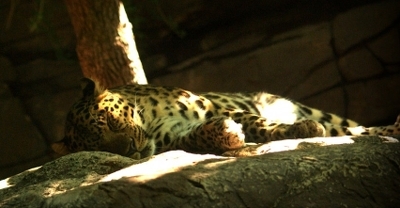 Brian Switek with National Geographic’s Phenomena blog group wrote about jaguars have helped build the fossil records since they prefer to drag their prey back to a den. Finding one of these old dens then provides easy pickings for the researchers. Plus, Nat Geo has some pretty awesome photos.